Friends remembered McCartney showing a talent for painting when at the Liverpool Institute, but McCartney's love of painting only surfaced after watching Willem de Kooning paint, in Kooning's Long Island barn. 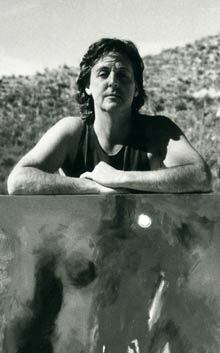 In 1966, McCartney met art gallery-owner Robert Fraser, whose flat was visited by many well-known artists. McCartney met Andy Warhol, Claes Oldenburg, Peter Blake, and Richard Hamilton there, and learned about art appreciation. McCartney later started buying paintings by Magritte, and used Margritte's painting of an apple for the Apple Records logo. He now owns Magritte's easel and spectacles. work in UK galleries. The first UK exhibition of McCartney's work was opened in Bristol, England with more than 500 paintings on display. McCartney had previously believed that "only people that had been to Art school were allowed to paint" - as John Lennon had. "I've been offered an exhibition of my paintings at the Walker Art Gallery in Liverpool where John and I used to spend many a pleasant afternoon. So I'm really excited about it. I didn't tell anybody I painted for 15 years but now I'm out of the closet."